It is easy to look back on your life and recount your struggles and trials. But what if your struggles and trials are actually blessings? My adult years have been filled with struggles. Despite the constant trials that surface in my life, my adult years have also been overflowing with blessings. As Christians, we are to be content in whatever our circumstances. My story is a story of discovering hope in the midst of trials. It all began when I was pregnant with my first son. A new baby is a time of joy and rejoicing. It was also when I began to realize there was something very wrong with my body. It wasn’t immediate but it also wasn’t temporary. I pushed it aside until I was expecting my second child, and it became more evident and troublesome. After many trips to the doctor, I was given disappointing news. This was not going to go away – and this would eventually lead to my end. It is difficult to understand why these things happen. Yet I pushed it aside, because it wasn’t immediate just yet. A few years passed on, and those children started to grow up. My husband and I were hit with another bit of news which was both shocking and expected. Our oldest son was diagnosed with autism. Yet another struggle to face. There was a period of mourning the fact that he might never be able to have the life every Mom dreams for their child – with an honest hard earned career, marriage and a family. But Jesus replaces despair with hope when you call on Him, and soon I realized it doesn’t really matter what he is diagnosed with, he will always be the same amazing person that I know and love with all my heart. There are some hard days, and mornings are especially difficult. There are some days we count it fortunate we make it out the door with everyone wearing clothing and having had something to eat for breakfast, even if we are late or disruptive. But those who call on Him for help will receive it if they ask in faith. I couldn’t accept that same truth for myself, though. As the years were progressing, my situation was becoming worse. I cried myself to sleep many nights. The appearance of the disease was worsening and the pain was now present. Living my life the way I was accustomed to was no longer an option. It became even more evident when I was informed I would likely need to use a cane to get around. That broke my heart into a million pieces, because I could no longer ignore that this was a struggle I would need to face. My first reaction was anger. I was angry with God for allowing me to have to face this struggle. I was angry that it would make my life difficult. I was angry that it would interfere with my family life. With young children, I could no longer sit on the floor and play with them. I could no longer go for long walks in the summer, something that we all used to enjoy. I was angry that my appearance was repulsive. When I was done being angry, I grew depressed. I didn’t want to leave my house. There was a summer where I didn’t go to church with my family. I overheard someone comment about my appearance in a hurtful way, and didn’t want to hear anything more. No one noticed my absence, or said anything to me. I was filled with bitterness and felt betrayed by fellow believers. That summer, God turned things around and taught me forgive others as He had forgiven me. When I did finally return in the fall, I felt restored and happy to be rejoined with my church family. I still struggled with the question as to why God had allowed this to happen to me. It was certainly a major part of my life. Fear and worry gripped me constantly. I soon realized I hadn’t even turned to God for comfort. That should have been the first thing I did. When experiencing trials, I always turned to my husband and my parents – I felt I needed the physical presence of a person in front of me to hold me and comfort me. However, the only One who can really comfort us with a lasting comfort is our Father. Once I realized my mistake, I let go of everything and gave it all up to Him. In order to have peace, we must have hope. What is hope? One definition is that hope is a feeling of trust. 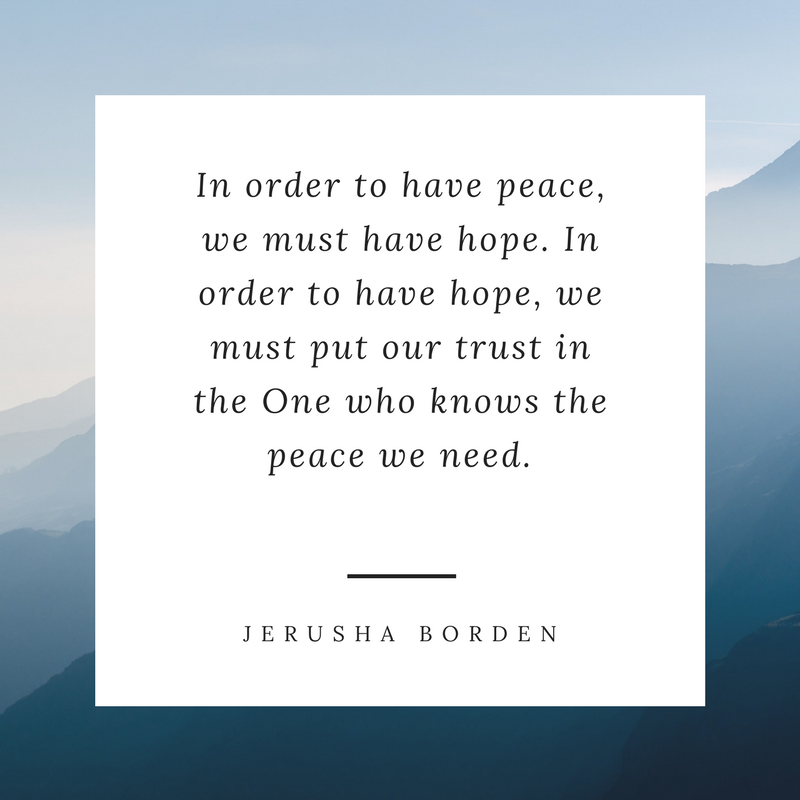 In order to have hope, we must put our trust in the One who knows our every need and can provide the peace we need. I have known all my life that God promises peace. But in this situation, I was feeling broken. I didn’t see how He could work this together for Good. It took me awhile to realize that this verse outlines a process. You can’t just bring your requests to God. You need to be thankful. You need to be hopeful. You need to trust. Are all of those things easy? No. Are they all necessary? Yes. Was I really thankful for this struggle? Is anyone thankful for a struggle? No, not immediately. It took me so many years to answer that question with a resounding yes. James 1:1-2 says this: “Dear brothers and sisters, when troubles come your way, consider it an opportunity for great joy. For you know when your faith is tested, your endurance has a chance to grow.” I could be thankful for this – it was just another way that God was shaping me who He designed me to be. My heart changed from being ungrateful for this struggle, to being thankful for it. It then blossomed into being an opportunity. One of the most important parts of suffering is the comfort and hope that we can share with others when they are suffering. I have been able to share with others who experience health struggles, encouraging them and offering hope in times of trial. Hope is a feeling of trust. I have to trust that He has a plan for me. No matter what my struggles, nothing can change the fact that God’s promises are forever true. Trusting is not easy, but hope is easier. This struggle will not end. The situation will become worse. I will need to use my cane every day, instead of just once in awhile. I might even need to be in a wheelchair. But with hope, I can praise God in this storm. With His peace, I can be thankful for days where the pain is not as great. I can be thankful that I am still able to use my legs to walk, swim, and dance until I can no longer do those things. And even then, I’ll find a way to praise Him. After all, He alone is my hope.